Commercial grade vinyl tile is stronger, thicker and more resilient that standard self-adhesive, peel-and-stick tile. This type of tile was traditionally manufactured in very basic colors like brown, gray and other neutral tones and used strictly in business or commercial settings. Today commercial grade tiles are more aesthetically pleasing, making them very attractive to homeowners looking to renovate their flooring with a sturdier, longer-lasting choice of tile. 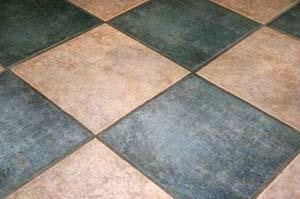 Commercial tiles do not come with a pre-set adhesive on the back of the tiles; they are dry on both sides. To secure them in place, apply a layer of adhesive to the floor prior to laying the tile down. For this adhesive to be effective, the floor has to be completely clean and devoid of dust, dirt and debris. Remove the baseboards or trim prior to cleaning the floors and installing the tiles. The trim or baseboards can be replaced after the tiles are laid, resulting in a more professional-looking job. This also helps cover up any minor gaps along the edges. Use a chalk string to separate the room into four quadrants; apply the adhesive and tile to one quadrant before moving on to the next. When you venture to the hardware store, you'll see a wide array of tile adhesives of varying prices. Do not purchase inexpensive adhesive as this is one product where you really do get what you pay for. Splurge on the higher quality adhesive and you'll enjoy your flooring much longer. Apply the adhesive using a notched trowel, making the adhesive's thickness never more than the gap in the notch. Apply the adhesive using wide arcs, like a rainbow, and avoid leaving any large blobs of adhesive. The manufacturer's instruction on the adhesive should state how long you should wait between applying the adhesive and laying the tiles. Ideally, the adhesive should be tacky to the touch. Start at the center of the room where the four quadrants meet and align your first tile so it follows the chalk line perfectly. How you lay the fist tile will affect every tile afterward so use caution and lay it as straight as possible. Install every whole tile in its place until you get to the point where you have to cut the tiles to fit. Cutting the commercial vinyl grade tiles is one of the more challenging aspects of the job, so always measure twice so you only have to cut once. Start with the tiles that require only one cut. Once you have the measurements marked on the tile, use a sharp blade or utility knife to score the top of the tile. Scoring the tile will allow you to easily snap off the scrap piece of tile. Just be sure to always score the top of the tile and not the bottom because in some cases the side that's not scored can fray.